A few years ago, the Las Vegas tourism board launched a campaign to promote Sin City as a family destination. I think it was before the whole “What happens in Vegas…” concept became a regrettably overused part of the vernacular, along the lines of “Got milk?” I’m not sure how successful the family branding was, but I might consider bringing the kids there if I found enough for them to do. Have you been there with kids? If so, I would love to hear your comments below. I put the question out there on Twitter, and @dgcampagna told me she likes bringing her kids to the Lied Discovery Children’s Museum and the Ethel M Chocolates factory tour, among other places. Vegas is on my bucket list. I’m not much of a gambler, but Matt likes a poker game. His dream is to enter a tournament and become the next World Poker Tour champion. Sorry, we don’t have an extra $10K lying around for the buy-in. Regardless, we hope to get there someday. This month’s guest post was written by someone who did get there recently. I met Lexy at the 2010 BlogHer conference. She’s a super-friendly, travel-savvy blogger over at KissMyCountry.com. 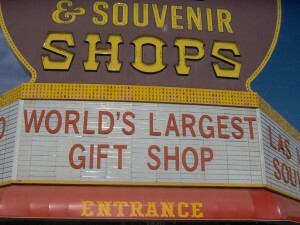 During a girlfriends’ weekend, she discovered Bonanza Gifts, the World’s Largest Gift Shop. I can only imagine the delightful, large-scale cheesiness of this Vegas souvenir store, but she experienced it firsthand! Lucky. During our recent Girl’s Weekend in Las Vegas, my friend Ursula and I visited Bonanza Gifts, located on The Strip across the street from The Sahara hotel and casino. Ursula actually volunteered to come along to buy gifts for her children– no coercing. I was glad for the company. We took a cab and arrived pretty quickly – the Strip was empty on the Saturday morning we’d earmarked for our visit. I know Traci from BlogHer ’10, love her blog, and since I was headed to Vegas I asked if there was any “largest whatever” in Vegas that I could visit on her behalf. Traci came up with the gift shop and the World’s Largest Gold Nugget at the Golden Nugget Casino. I chose the gift shop because I’m a gift shop fanatic, leaving the Nugget for another fan. 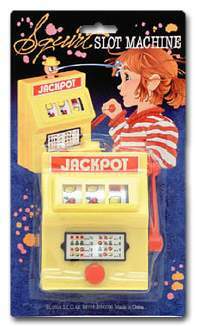 What kid doesn't need a slot machine squirt toy?